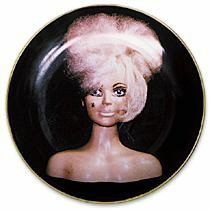 For the occasion, Robbins created three TV commercials to promote the plate, comprising a separate and related work (“Until now we’ve never really had TV commercials for contemporary art, but it’s time”). 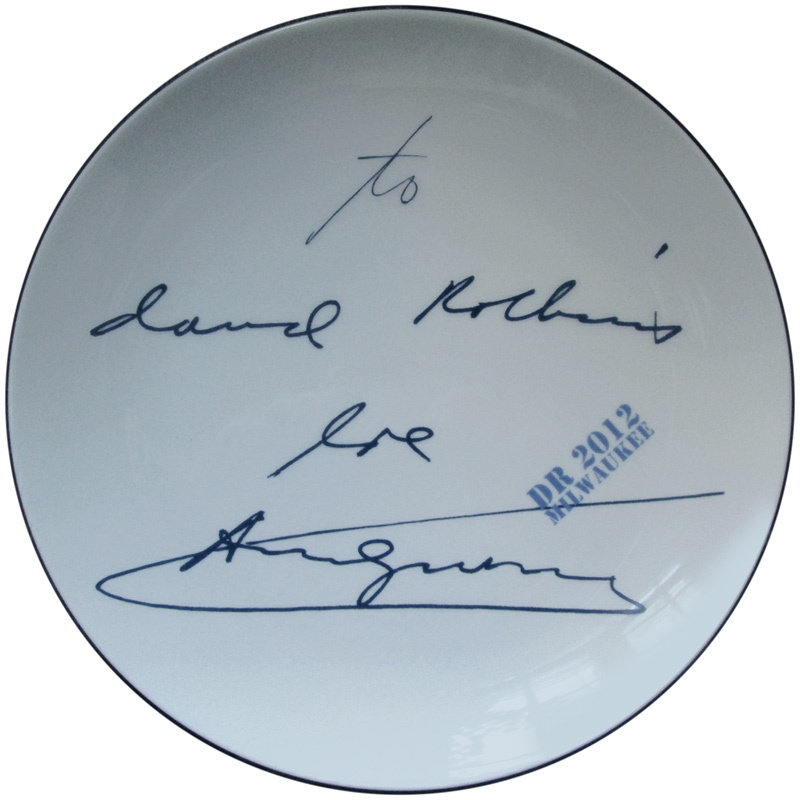 The 10 ¼ inch porcelain plate is signed on the back by the artist and is produced in an edition of 250. Memento (From Andy With Love) is being released at the price of $125 and is available here. David Robbins is known for investigating the intersections between art, entertainment, and comedy, with special attention to the transformation of the artist in the visual system. Subsequent to working for Andy Warhol from 1979 to 1981, Robbins achieved recognition with Talent. (1986), eighteen “entertainer’s headshots” of contemporary artists, which was the subject of a twenty-fifth anniversary exhibition at Marianne Boesky Gallery, New York, in 2012, and The Ice Cream Social, a fifteen-year-long project (1993-2008), comprising installations, performances, a novella, and a Sundance Channel TV pilot, that Hans Ulrich Obrist has cited as pioneering the “expanded exhibition” format. 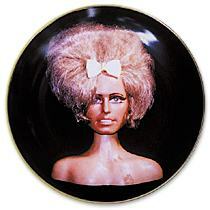 Adora Porcelain proudly presents The Girls by John Waters. 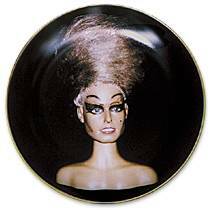 A limited edition series of three 10 1/4 inch plates featuring three mannequin busts transfigured through thickly applied make-up and elaborate wigs into the larger than life characters Tina, Kim and Kathy. An uncanny imitation of life is conveyed in the penetrating stare of their sparkling eyes, and each bust, distinctively styled, evokes a striking personality. These are the artist’s “friends,” who share his home in Baltimore. Known for his irreverent approach to cultural iconography, Waters regards the collectible plate as a perfect vehicle for sharing his personal sensibility with a wider, yet still peculiar audience. The Girls is available as a set of three plates, each plate is signed and numbered by the artist. This edition is limited to 300 sets. The price for each set is $750. Adora Porcelain plates are available at the New Museum of Contemporary Art, Printed Matter, The Gagosian Store and the Cooper Hewitt Museum shop in New York, Art Metropole in Toronto, Canada, and at the Galerie de Multiples in Paris, France. For further information please call 1-212-989-6095 or email adoranewyork@yahoo.com. 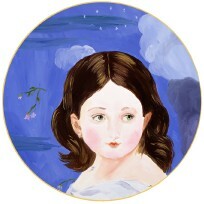 Adora Porcelain announces a new limited edition artist's plate: Youth, by Jack Pierson. Each plate in this edition of 500 is signed by the artist, and costs $500. For more information or to see a preview, please click here, or contact Adora Porcelain (telephone: 1-212-989-6095; email: adoranewyork@yahoo.com). 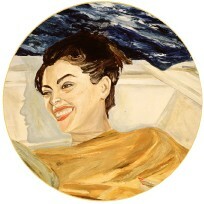 Adora Porcelain initiates a series of limited edition artists' plates with Times of Day; featuring paintings by Karen Kilimnik, Robert Greene, and Nicole Eisenman. Three portraits are brought together to convey different aspects of time's passage through a day. Dawn by Karen Kilimnik reproduces an image of the Roman Goddess of Spring Flora; Day by Robert Greene shows a woman relaxing on a boat and Dusk by Nicole Eisenman features a woman contemplating the transition from day to night. The pictures retain their individual identities while evoking new poetic possibilities suggested by the theme, Times of Day. The intention is to describe a conventional narrative structure with images that open the story to many different ideas. 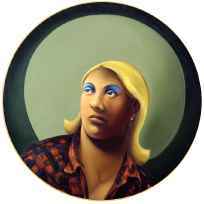 As a group the plates are like paintings in an exhibition, each plate, however, is an independent work which can be purchased separately. Adora Porcelain is committed to producing the highest quality porcelain editions. The plates are made on Long island in New York State. Each plate has a gold border and is signed and numbered by the artist. 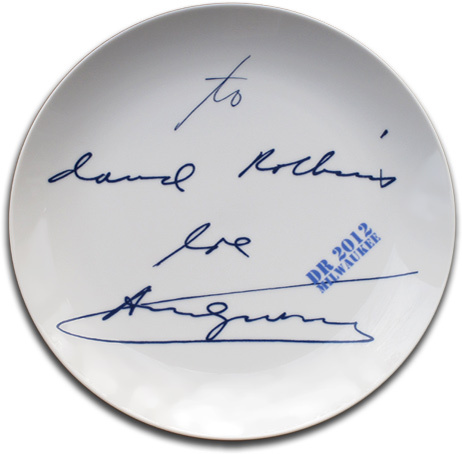 The edition size is 150 and the diameter of each plate is 10 1/4 inches. The price for Dawn is $1500, the price for Day is $250, and the price for Dusk is $500. For further information please call 1-212-989-6095 or email adoranewyork@yahoo.com. Adora Porcelain plates are available at the New Museum of Contemporary Art, Printed Matter, The Gagosian Store and the Cooper Hewitt Museum shop in New York, Art Metropole in Toronto, Canada, and at the Galerie de Multiples in Paris, France.